I have been away for sometime now, but peeked in as a lurker from time to time. I happened to log into the live chat tonight and a conversation was going on about projects and repairs people are doing or want to do. I was asked to post my project and agreed i would. Well, here it is. 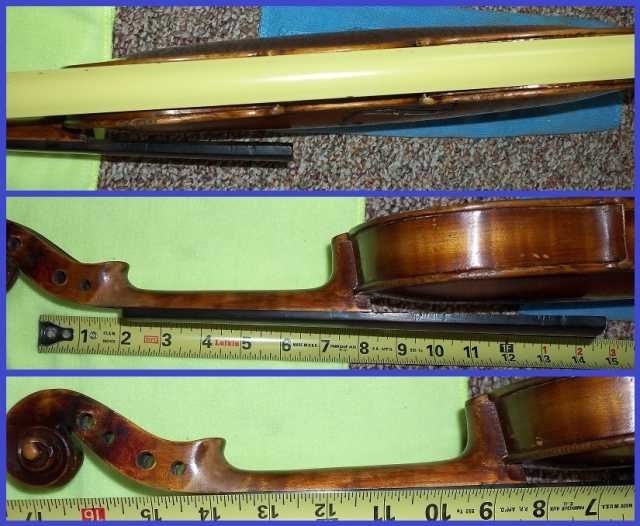 A Circa 1885 Stainer violin. It was blessed early this summer by a retired minister (92 years of age). The violin was his grandfathers. 2 owners other then my self. I know the man. 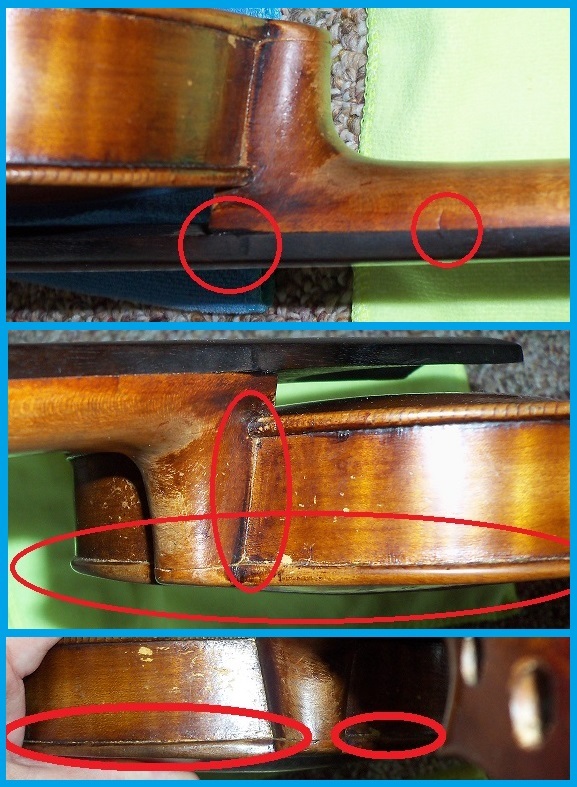 The instrument was in sad disrepair, missing pegs, not all strings present (Mostly gut strings that are cracked and brittle), a fallen sound post, several very small separations in the body and seams (at wood plate joining) and a break in the peg box. The box was professionally repaired in the late 30's by a luthier who's name is no longer legible on his cloth name tag inside. I have a short spoken story to go with it I will write down eventually. 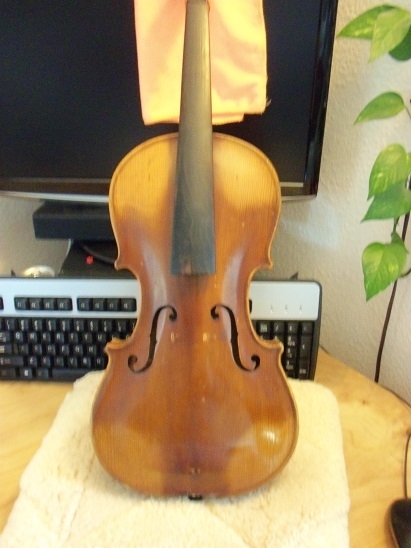 Nothing grand or glorious, just an old church fiddle that needed first aid and a new home. 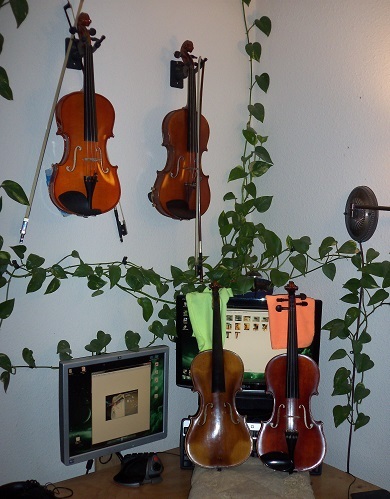 The final image is my 4 violins. Top left the Cremona (V185), top right my beloved Lorenzo. Bottom right an Eastman VL501 series and the bottom left my newly acquired (and under much duress of repairs) Stainer. I highlighted the splits and loose seams in red in a few images. I ran out of hide glue and awaiting my next shipment. Its a pain to learn to use that glue. Temperature and water to glue raio sensitive and all. It sets up faster then you are lead to believe. It is water soluble, but so is the stain and older original glue. I am recutting the mother of pearl from shells off the Oregon coast. 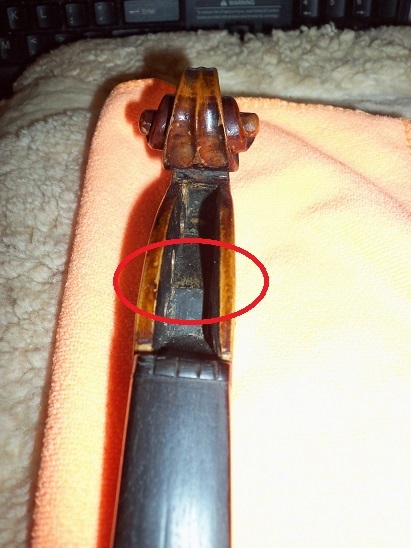 The inlay for the tailpiece has fallen out years ago. Its a pain as its very brittle and splits into fine layers. but again. I am learning. 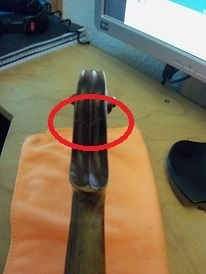 It is missing the saddle and the nut is deeply grooved. New items are due to arrive Friday this week. The finger board is slightly grooved, but I am keeping that in tact. I love the warn varnish look and the warm feel of it. I may end up replaceing the neck and scroll/peg box. If I do, it will be from another parted out Stainer I get off ebay or somewhere. Ask away with any questions. I am more then happy to talk about the project if anyone is interested. Great to hear from you after a very long absence--glad you're still around! 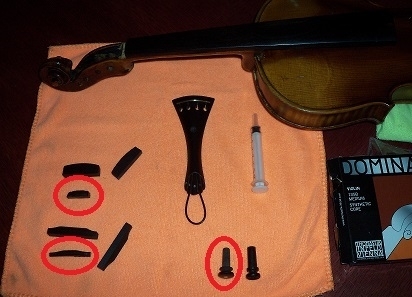 Good luck with your major fiddle repair project! Wow what a project. I'm looking forward to following your progress so please post updates. Thanks. What a great project! Thanks for sharing your progress. Looking forward to the updates! 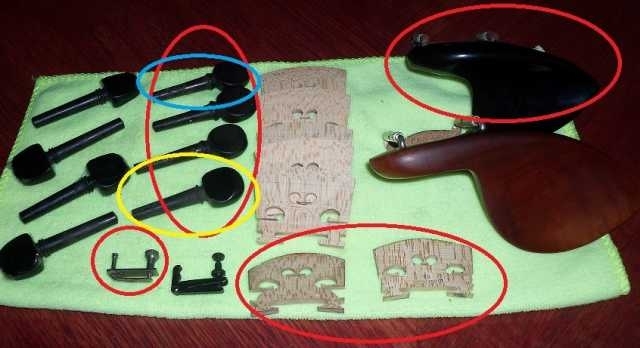 The fingerboard looks significantly grooved, you are replacing the nut so why not replane the fingerboard? Oh thank you for posting... What a gorgeous rehab! well it is a project, more so then I anticipated. I do some woodworking on my own, so its not completely foreign to me. Kevin - I think the main reason is the age and how it looks. I know looks can be replicated and sometimes even built upon. I was waiting on the final assembly before making that decision. It is grooved, as would be expected, but I am not sure it will make that big a difference. I don't know if I can lower the new nut slightly and possibly shave the finger board - ever so slightly - to compensate for the volume of wood that will invariably be lost in its repair. If the scroll/neck/peg box needs to be replaced, I will certainly at that point really think about it. I will have to separate the finger board from the neck at that point anyways. For now, I am just going to get it back to a playable point. Then I'll work on fine tuning the instrument - by that I mean changing out what hinders it play. I'll post more as I work on it. The parts didn't arrive today (not really expecting them until Friday, but you never know). As soon as the glue arrives, I'll be repairing the seam split near the end pin on the faceplate. I do have clamps, so if need be, I'll separate the ribs from the face/back remove the old glue and see if I can get the violin back and "square" set. 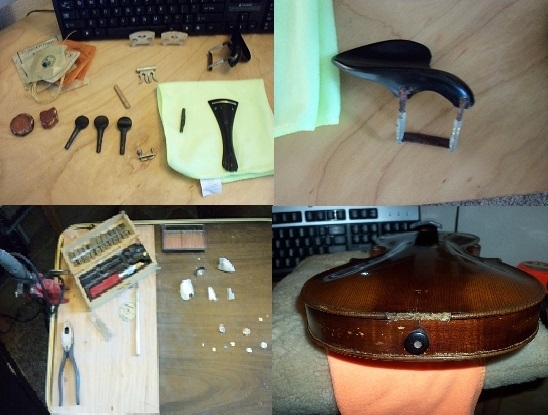 I hand shaved pegs for one of my other violins and they fit remarkably well. they hold fast, and easily turn to tune. The pegs I removed are in great shape and are slightly larger and "longer" then the holes for the Stainer. So, I'll shape them to fit, cut to length and polish then for it. edit : as a side note, it is very strange to work on this. The belly is really pronounced. 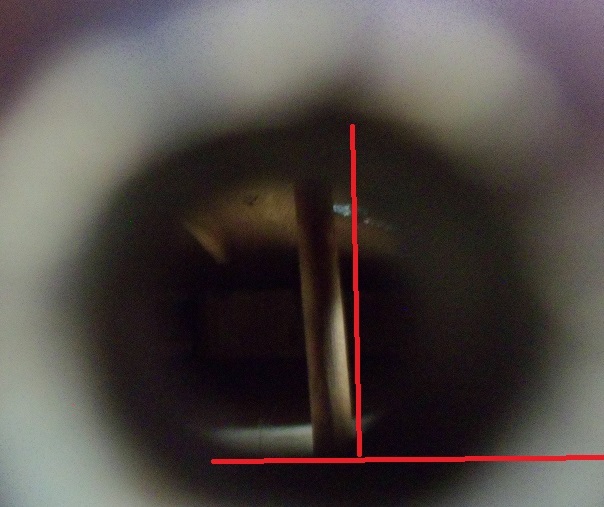 Although the Bass bar is in tact, I am not sure there are corner supports adjacent to the F-holes. Time will tell. Cool project. Thanks for posting all the details. The strings, nut, saddle and tail gut arrived today. The glue didn't show. That's a bummer! I'll post pics of the arrived parts this evening. Nothing special, just an update. The red "ovals" depict the original items. The syringe next to the tail piece is for the hot glue if it ever shows up. I do have a spare end pin, but the original still has the mother of pearl inlay. I may use it, but it is a little loose in the hole/block. The nut and saddle are going to need quite a bit of reduction to make them work properly. I'll worry about the string grooves when I get that far. I do have calipers and they appear at a glance to be proportionally set on the nut centered left and right. I also have the new gut on the tailpiece. The blue peg is really rough. looks like it was cut with a rasp and sanded with a stone or brick. it is in horrible shape and is too narrow for any of the holes.. The yellow peg doesn't fit any holes, its too big and was never cut or drilled. 1 of the 3 originals has the pearl inlay still. The bridges are going to need a lot of work. The feet are going to take some effort to cut and shape. 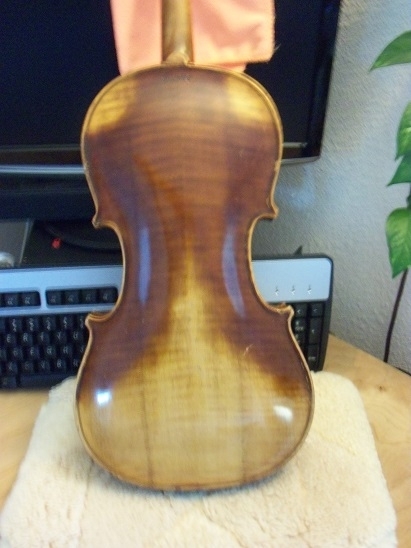 Its going to take a lot of 600 grit sand paper on the belly of the violin and LOTS of rubbing. The width of the bridges need to be taken about in half, then tapered. Both of the original bridges are shorter then the finger board when sitting on the belly. I think they were cut by the owner and then realized they were cut too short. I'll ask and get more info on that. Now the meat of the project. The length without end pin is shown. Also I have the afterlength listed. (the tail piece "rubbing" is outlined in the red circle and is just about precise for the string stoplength. About 1/6 is a starting spot for lengths, and this is almost exactly spot on. The green circle is a small bit of the pirfling that is missing. It appears to be a soft brass, but I am not sure if i'll repair that or leave it. I removed the nut to see what I was going to be in for. It looks like a lot of carving and shaping. Another possibility is that the neck angle has changed. Chances are if the owner cut the bridges too short he would have tossed them right away. 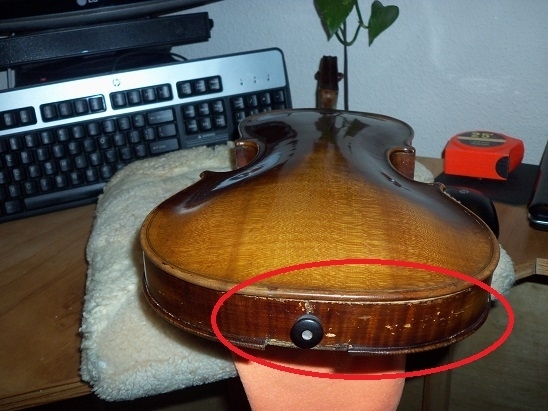 Make sure that the neck is really secure, otherwise this would be the right time to reset it. Here is a close up of the neck and body joining. I never thought of what you suggested, but to my untrained eye, I don't see anything that might suggest the warping, dipping or angle separation. Disregard the tape measure ruling. I used it soley as a straight edge. It appears to be off slightly in the picture, but its because my 3rd arm couldn't hold it straight. These are blemishes in the varnish. 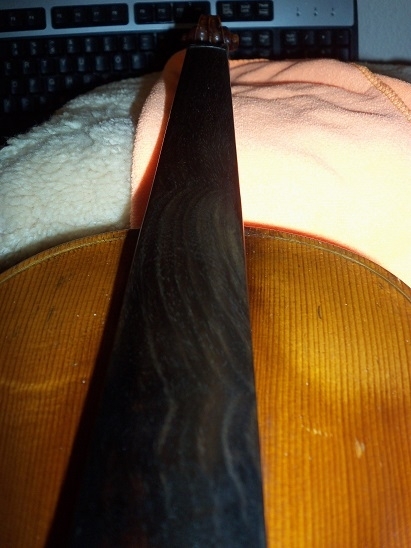 On the neck, there was a splinter of wood chipped out, but it is not a crack. A dental pick showed it to be solid wood that was painted. The other areas would not allow a feeler gauge or a dental pick to penetrate. So, it just appears the varnish is cracked from shrinkage/age. 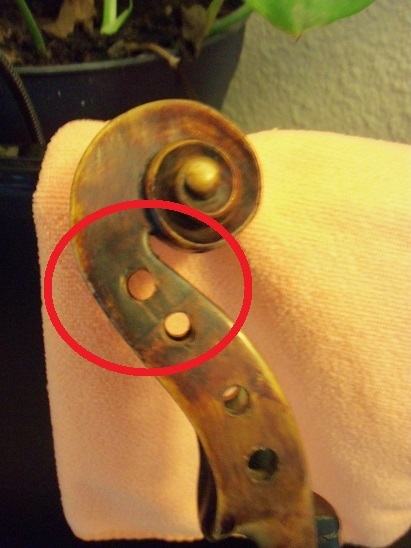 It looks like the neck block is coming loose and when the strings are tightened it pulls the neck reducing the angle of the neck. This makes it so yo have a very short bridge and when the string tension is realeased the angle of the neck can be pulled back. 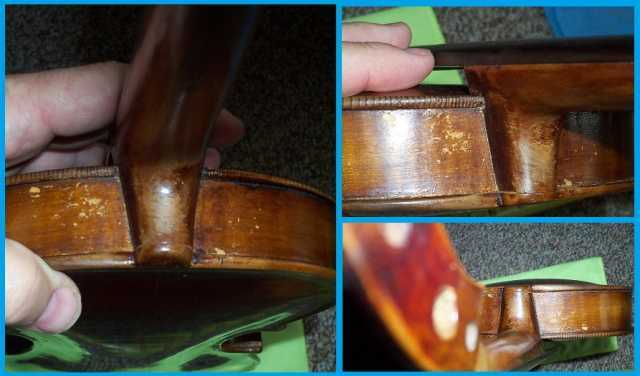 This can be repaired by regluing the neck block to the top plate. Kevin & Pierre : Oh I see now what you guys are talking about. Not necessarily where it joins the back plate or ribs, but the top plate. Yes, it does look like that might be the case. I can get the end of dental pick in the tiniest of gaps. the feeler gauge seems to stick on flaky varnish and wont quite get in there. I can even verify it by holding the violin in my lap, grasping the sides of it and gently pressing down on the end of the finger board. It dips ever so slightly, but even more, when I release it, I can see the movement on (or more like above) the plate where the neck should be secured. well, it looks like I'll be separating that too and cleaning the older glue residue. Thanks for the advice on that and the clarification. I would have missed that for sure. If you need any help don't be afraid to ask. I will help you as much as I can. FM this is going to be a slow process but it will get done. I have high hopes for this ambitious project. Its like most things, just break it down into little digestible bites..
Kevin, thanks much for the offer. You can bet I will bounce things off you. I'll keep the photo archive of my progress going. If you want to see something clearer, just ask. If others have ideas or suggestions, I am open to listen and probably (hopefully) learn something. Kevin and Pierre, I talked to the previous owner of the Violin. I think his story confirms what you both said and I certainly believe it. He said it seemed to go in and out of tune incredibly fast at temp and humidity changes. Also he said it had a buzzing sound from the strings riding on the finger board. (his memory was as little confused on some of it). He then said at times it played great. He remembers cutting the bridge several times and it seemed to help. He didn't recall when he cut them, but it was years ago. He also said he tried to set the sound post. Since I brought it up. It fell over when he was playing in a church concert. One of the guys had a tool and stood it up. He said since, the sound wasn't as crisp and it didn't "shout to the Lord", as he put it. He said its not been played in a long time. He was also glad so many people are taking an interest into getting "the old girl back up to snuff"
hehehe, how can you not want to just keep working on it. That is part of my motivation, right there, straight from the preachers own mouth. I know what you mean. It has a life and you have to keep it going.